Link VS Cloud | DEATH BATTLE! | ScrewAttack! First seen on ScrewAttack.com on July 13, 2012. Follow us for updates, fun, and to get your voice heard! Link VS Cloud is the twenty-second episode of Death Battle. This episode was sponsored by Gamefly. 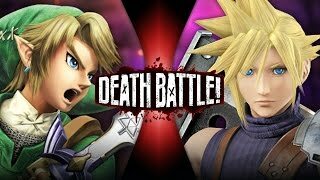 Link (Zelda) vs Cloud (FF7) in a Death Battle? History . ScrewAttack was created in 2006 by Craig Skistimas and Thomas Hanley. The first show featured on the site was an audio podcast called SideScrollers. Mario VS Sonic | DEATH BATTLE! | ScrewAttack! Kratos VS Spawn | DEATH BATTLE! | ScrewAttack! Vegeta VS Shadow | DEATH BATTLE! | ScrewAttack! Felicia VS Taokaka | DEATH BATTLE! | ScrewAttack! Luke Skywalker VS Harry Potter | DEATH BATTLE! | ScrewAttack!